Opinion: What’s wrong with this picture? Which quadrant of the city has no dropboxes? 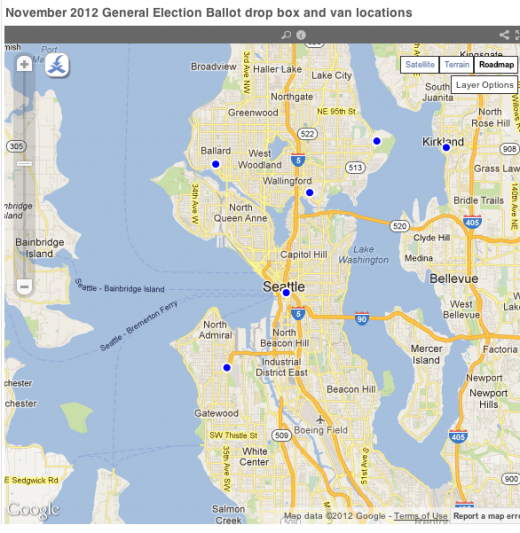 Tonight, I am planning to drop off my ballot at one of King County Elections’ 24-hour dropboxes. I could mail it, but prefer to drop it off and know for sure that it will be received. Unfortunately for me, while there are dropboxes all over the county, there are none in any part of Southeast Seattle. There are also vans (with more limited hours) in several places to collect ballots. Once again, there are none in Southeast Seattle. The nearest dropboxes to us are downtown and in Renton. There is also the West Seattle drop van, which closes at 5 p.m. And there is an accessible voting center (where you can also deposit ballots) at Union Station, but that also has limited hours. Voting by mail is, generally, an improvement that promotes more participation in the voting process than the old polling system. But we should not assume that it has solved all accessibility issues, nor that vote-by-mail means that dropboxes are unnecessary. At the very least, it is not right to require payment (even of a mere stamp) to vote. But there are other reasons dropboxes are useful. For example, the polls are open until 8 p.m. on Election Day, and last minute votes are just as valid and acceptable as any others. (Otherwise, we’d close the polls earlier.) In most areas, there is no way to get something mailed that late, so a dropbox is the only way to vote in the late afternoon or early evening on November 6. There used to be more dropboxes in the city, but King County Elections had to remove many of them to save money. Saving taxpayer money is good, but shouldn’t every quadrant of the city (at least) have a dropbox, or at least a van? North of downtown, there are three options, all north of the canal: two dropboxes and a van at the University of Washington. South of downtown, there is only the limited-hours van in West Seattle. Shouldn’t there at least be an attempt at equity here? I know not every neighborhood can have a dropbox. It’s a problem that we provide so few of them, but I understand that with current financial reality King County Elections cannot put dropboxes everywhere we might want them. But shouldn’t there be an attempt to distribute them fairly? And wouldn’t it make sense to put dropboxes in a part of the city that has many lower-income voters who may prefer to use a dropbox to save a stamp, or who may not have easy automotive access to dropboxes further away? For those of us in North Beacon Hill, the downtown dropbox is not too far a trip. But Southeast Seattle is a large area, and it’s not as easy for everyone to get downtown as it is for most of us on North Beacon. If Magnuson Park can host a dropbox — one of three locations north of the Ship Canal — Southeast Seattle ought to at least warrant the presence of a van to pick up ballots in future elections. As a disinterested non-resident, I think that traveling downtown to a drop box isn’t such a burden. If I lived on Beacon Hill this would needle the heck out of me. Lucas Walter liked this on Facebook. Stacy Rosevear liked this on Facebook. Michelle Koven liked this on Facebook. Tyler Allen Hill liked this on Facebook. Vinsy Szeto liked this on Facebook. Maggie Garcia McComb liked this on Facebook. Jane Altemose liked this on Facebook. As a South Seattle resident this bothers me to know end! without a drop box, you have to put a stamp on it and mail it in, and that my friends is having to pay to vote! Uh, not cool. Anyone bother to note the ethnographic statistics related to this issue? Hao Tong liked this on Facebook. Gina Englund liked this on Facebook. John Shrewsbury liked this on Facebook. Thank you for posting this. It is yet another example of the way SE Seattle is treated by the City of Seattle and King County. We are ignored, our concerns are brushed aside, and yet our community is touted as as success; Seattle’s embodiment and celebration of diversity. The message toward our diverse community is loud and clear: you don’t deserve the same privileges and treatment as wealthier, homogeneous Seattle neighborhoods. Yet another example of how Southeast gets the short end of the stick. I am lucky and privileged that a drop box is a block away at the library. I do remember standing in line having senior volunteers look me up and voting in a little booth so this is a big convenience. For those in neighborhoods without, make some NOISE to the county office! I would support that! Carmen Espanol liked this on Facebook. Kim Logan liked this on Facebook. Jessica Louie liked this on Facebook. Pingback: Beacon Hill Blog » Archive » Election day! Don’t forget to vote! I know someone who used to work in elections. I was told the the king county council cut $300K from the elections budget which is why there is so few drop boxes. So please complain to them. Also I was informed that the elections office doesn’t return ballots for lack of postage. They have an agreement with the post office. So basically if you drop it in the mail box it will get there with or with out correct postage.